Back in 2003, David and Lu Anne Ringhand had one tall palm tree in the corner of their lot and a yard full of Date Palm seeds. They took the palm tree out and hauled off two truckloads of palm seeds. They leveled the yard by hand and planted their first flowerbed, knowing absolutely nothing about plants. They chose Mexican feather grass, calla lilies, Dianthus grass, and cocoa mulch in between — because it smelled delicious. Next, they outlined a path. Next, David wanted a tree to block the stop sign and the telephone pole on the corner. Some of the plants died, and they learned about drought tolerant options like succulents. They replaced dead plants with rosewood, African daisies, desert sage, hibiscus, salvia, and other butterfly plants like Wiri Blush Hebe. They acquired signature pieces such as the Blue Atlas cedar and the Australian peppermint tree. “My favorite pastime is to count my plants. 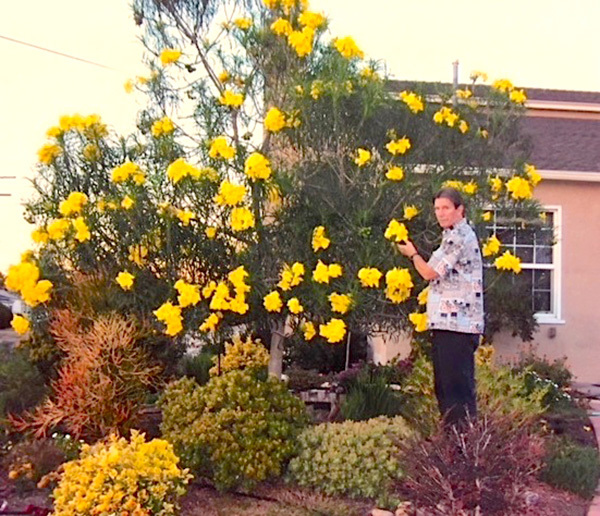 I have 220 different plants and 92 different species,” David said. Go slowly, but surely. Keep adding when you can and buy three of everything because at least one will die. Buy four-inch pots; they’ll grow and their cost won’t break the bank. Shop at nearby nurseries so they have the same climate as your home. Some plants wilt during the day to protect themselves. Water early morning or late evening. Wear sunscreen when you garden, especially on top of your ears. Don’t use Round Up. It kills bees and the health of our gardens depend on bees. Plant in the spring and enjoy your plants in the summer. The Ringhands are La Mesa Beautiful members who recently donated plants to the Annual Plant Sale held the first weekend of May. Their home garden has also been nominated for a La Mesa Beautiful Spirit Award. For more information about La Mesa Beautiful, or to schedule a visit to the Ringhand garden, visit lamesabeautiful.org. — Nancy Johnson is secretary of La Mesa Beautiful.